Prepare for a winning stay at Courtyard Annapolis. Conveniently located in the Baltimore-Washington Metropolitan area, our hotel is near the United States Naval Academy, Annapolis Mall, Historic Annapolis Museum, Sandy Point State Park and M&T Bank Stadium. Whether on a business trip or taking a break from your routines, make yourself at home in spacious rooms and suites with complimentary high-speed Wi-Fi, ergonomic workspaces, flat-panel TVs and plush bedding. Join us for breakfast and dinner at our on-site restaurant, The Bistro, and grab snacks and drinks from The Market, open 24 hours. 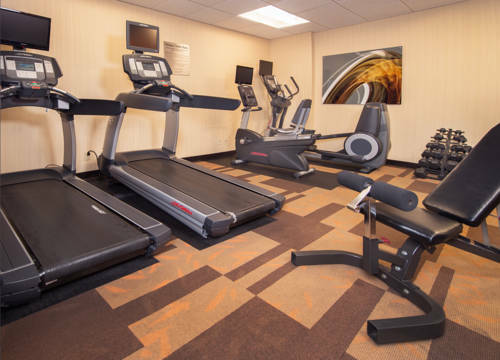 During downtime, you'll find it easy to maintain your wellness plans in our well-equipped fitness center with cardio machines and free weights. Relax your muscles afterward in our indoor whirlpool, or opt for a swim in the pool under a greenhouse ceiling. Should you need to work, our two event rooms offer plenty of space. Treat yourself to comfort when you reserve accommodations at Courtyard Annapolis. The Bistro Eat. Drink. Connect. : Your Annapolis hotel dining destination for fresh breakfast choices in the morning and a variety of dinner and cocktail options in the evening. The Bistro also offers specialty beverages made with Starbucks coffee to help you get a jump on the day. The Bay Theatre Company Inc.